UNPO convenes a conference on the impacts and challenges risen by the China-Pakistan Economic Corridor. The event will take place on Monday 23 April 2018 at 17:30 in The Westin Grand, room Friedrichstrasse, Berlin. 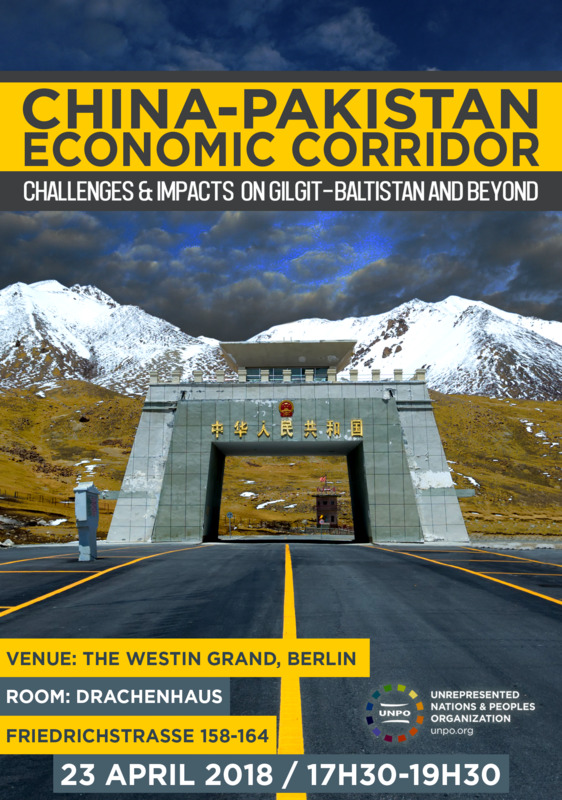 Top academics will brief Members of the Bundestag, state officials and the media on the current state of affairs in the region affected by CPEC, shedding a light on the disputed territory of Gilgit-Baltistan. China’s One Belt One Road (OBOR) is the country’s most ambitious infrastructure initiative to date, stretching for thousands of kilometers on the Eurasian continent. One strand of OBOR is the China-Pakistan Economic Corridor (CPEC), which seeks to carve an economic transport pathway through Pakistan by constructing roads, ports, railways, pipelines and other major infrastructure. For Gilgit-Baltistan – at the very center of this undertaking – this mammoth project is a bane rather than a boon. Declared a disputed territory by the United Nations Security Council in 1948, Gilgit-Baltistan still awaits its fate to be resolved under the auspices of the UN. Its territory, however, is already being cut through by CPEC, in an evident breach of international law. Although both the Pakistani and Chinese government advertise CPEC as an economic game-changer which will bring prosperity to all parts of Pakistan, the native people of Gilgit-Baltistan have expressed fears that its implementation will have severe social, economic, political and environmental consequences. Their concerns are that these projects would not only trigger an ecological disaster, demographic shift and land grabbing but also threaten their unique culture. As the project advances under alarming disregard for the local people, those who speak out against CPEC are systematically suppressed by the Pakistani military, which resorts to controversial anti-terrorism laws to silence any form of dissent. Germany and the European Union still have to define their position towards China’s rapidly expanding presence and influence in South Asia. In this regard, understanding the complex question of Gilgit-Baltistan is crucial and demands a constructive debate based on the findings of comprehensive research and underpinned by international law. Aiming to offer a platform for discussion on the matter, on 23 April 2018, UNPO will host a conference in Berlin in which academics will brief politicians, state officials, the media and the general public on the current state of affairs in the regions affected by CPEC.